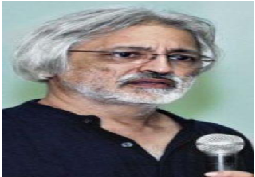 Anand Patwardhan is an Indian documentary filmmaker known for his activism through social action documentaries on topics such as corruption, slum dwellers, nuclear arms race, citizen activism and communalism (religious sectarianism. Notable films include Bombay: Our City (Hamara Shahar) (1985), In Memory of Friends(1990),In the Name of God (Ram ke Nam) (1992), Father, Son and Holy War (Pitra, Putra aur Dharmayuddha) (1995), A Narmada Diary(1995),War and Peace (Jang aur Aman) (2002) and Jai Bhim Comrade (2011), which have won national and International awards. How Long Will they Control the Damage?